This is an old setup focused to trade trending and/or impulsing markets in the direction of the trend. The Entry Type uses Stop Orders as it is intended for fast volatile never returning markets like crude oil or gold. When the blue line is all outside the envelope, the setup has a trend. Otherwise it is in neutral state ; gray bars = do nothing. If we have red bars and current bar is touching the upper channel, then we have a possible short entry. 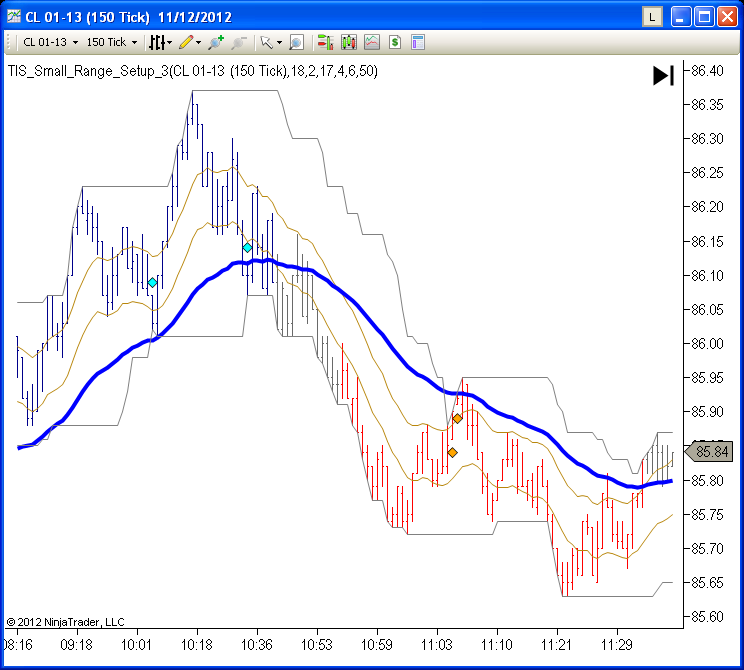 The short entry is a Sell Stop some ticks below signal bar ( usually 2 to 3 ticks ). If at next bar we have a better entry we move the order to new place, like on example above. 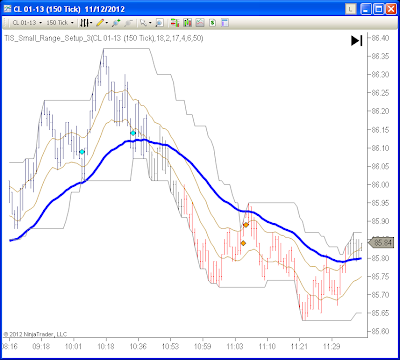 Once the entry is filled, the stop should be placed some ticks above the signal bar. Do you use this indicator in a room where we can watch it on a daily basis before purchase? This is a setup I really like beacause it lets me trade pullbacks in a trend.It is also simple to execute - which is quite important to me. With some backtesting I decided to add a simple filter - the setup bar must touch or be near the 50 EMA.This way you will miss some winners, but it will also filter out quite a few losers.You also get very high quality trades with a lot of potential for runners. This is an excellent idea, in fact something to take into account is that we are trading the main trend line, not perfect bounces but any pullback near it will produce signals. So the closer to it the better the signal. I use the 50 EMA on Range 9 CL as main trendline. showing how to use the indicator and some live trading examples..